Pictured (L-R), BU Development Officer Shawna English, Nasib Randhawa, Ramjit Mann, BU President Dr. Gervan Fearon, Happy Brar, and Harpreet Kaur. BRANDON, MB – Brandon’s Sikh community has established a new scholarship at Brandon University (BU) in honour of Guru Nanak Dev, the founder of Sikhism. The Guru Nanak Dev Scholarship will award approximately $1,400 each academic year to a continuing BU student on the basis of academic merit and a record of significant community service to a volunteer organization. 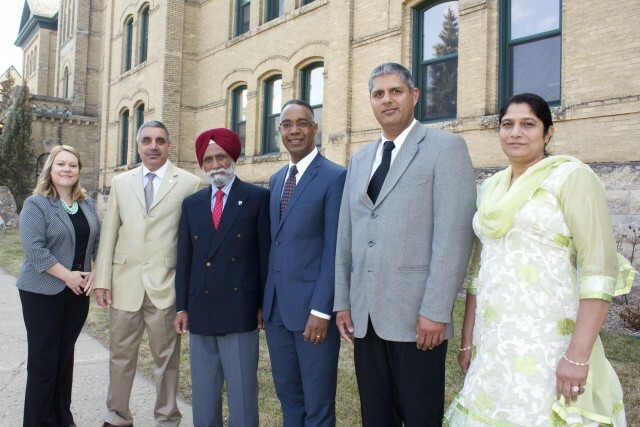 Mr. Mann led in the development of the endowment fund, which was supported by approximately twenty-four members of the Sikh community in Brandon. The fund totals $17,100, and will be matched by the Manitoba Scholarship and Bursary Initiative (MSBI) to total $34,200.